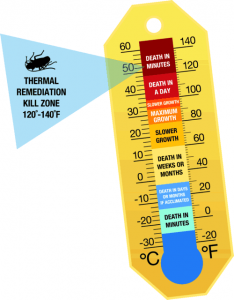 Heat treatment is the perfect application for heavy infestations, sensitive areas, and anyone wishing to keep pesticides out of their bedroom. Our certified Thermal Remediation® staff will be glad to visit your facility to inspect and design a treatment plan. We also offer on-site training for your house-keeping staff in bed bug identification and prevention.